Pokemon Black & White, I Choose You (on March 6th)! The fifth generation of the main Pokemon series will begin here in North America at the beginning of March. I've never made any attempt at hiding my love for the Pokemon games. 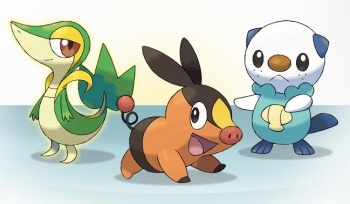 Despite questionable-looking new monsters with even more questionable-sounding names, Black & White's changes to the standard formula of the handheld titles and glowing critical acclaim mean that I'm looking forward to adventuring with Solid Snivy, Revolver Oshawott and Tepig Boss when the game hits shelves here in the West. While the first part of this press release could fit literally every game in the franchise since Red and Blue versions - the new titles will feature "new PokÃ©mon that players can catch, train and battle as they progress through the game, and some PokÃ©mon can only be caught in one version of the game" - Nintendo takes care to point out the new features, such as changing seasons and physical differences in the new region of Unova between versions. "PokÃ©mon Black Version and PokÃ©mon White Version represent a generational leap forward for the renowned series, delivering an unprecedented number of new PokÃ©mon to catch, battle and trade," said Nintendo's PR chief Marc Franklin in an official statement. "Whether you have played the PokÃ©mon video games before or are just getting interested in them, you won't want to miss PokÃ©mon Black Version and PokÃ©mon White Version." Thus, while most of the media is expecting March to be the month Nintendo's 3DS renders its older 2D-only brother obsolete, the good ol' DS will have one final hurrah with one of Nintendo's most popular series. I'll be there - will you?